Fresh from a two-day long ear-boxing from nearly every nation in the world over his unilateral support of going to war with Syria, US President Barack Obama kept to a promised sideline meeting with Russia’s embattle NGOs following the conclusion of the G20 summit held in St. Petersburg this week. Photo: Still from G20 pressroom footage on RT. 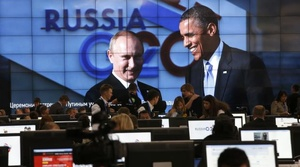 The civil society meeting was a preannounced part of Obama’s agenda in Russia, scheduled, some observers say, to irritate Russian President Vladimir Putin, whose relations with Obama have soured to vinegar since Putin took his third term in office. The meeting of nine activists took place at the Crowne Plaza Hotel near St. Petersburg’s Pulkova airport just before Obama boarded Air Force One to return to the US. Boris Pustyntsev, a cofounder of the Environmental Rights Center (ERC) Bellona, and chariman of St. Petersburg-based human rights watchdog Citizens’ Watch, was one of the activits present. He said the group would have been larger but some other invitees, including Moscow Helsinki Group director Lyudmila Alexeyeva and migration rights advocate Svetlana Gannushkina, had to decline because US officials kept switching the time and date of the meeting. The meeting was scheduled to last for 45 minutes, but Putsyntsev said it went over an hour. What effect Obama’s involvement in speaking with NGOs will have at a time when his own record of supporting and preserving human rights has been severely tarnished is unclear. Aside from the dominance of Syria during the yearly economic meeting, Obama is also dogged by the classified leaks of former National Security Agency contractor Edward Snowden, which revealed in breathtaking detail the extent of America’s secret surveillance activities around the world. Wanted in America as a traitor, Snowden was given political asylum by Russia last month, prompting Obama to stand Putin up for a meeting the two had scheduled last month. Despite the failings that world leaders gathered at the summit would not let Obama forget, his last minute stop with NGO representatives, judging by the response of activists who spoke with Bellona, was a resounding success at the end of a humbling week for the US president. “I explained to President Obama the dire situation for NGOs in Russia, and how the Russian government’s hostile approach to NGOs was unique and violated its own laws,” Pustyntsev told Bellona in a telephone interview immediately following the meeting. “And the president devoted sufficient attention to my concerns and to each of the speakers who had been invited to participate,” he said. Russian environmentalist Yevgeniya Chirikova wrote on her Twitter feed after the meeting that she discussed climate change and human-rights problems in both the US and Russia. Chirikova rose to prominence for her efforts to defend the ancient Khimki Forest north of Moscow from destruction by a federal highway. Though the highway was eventually built, Chirikova won the 2012 Goldman Prize – widely referred to as the Nobel Prize for environmentalism – for her active efforts in forming the Defend Khimki Forest movement despite often violent opposition, much of it suspected to be state sponsored. Chirikova and Pustyntsev’s presence were a strong signal from the US administration that Russia’s environmental malestrom is on the Washinton’s radar. Chirikova could not be reached by telephone for futher comment after the meeting. But she did post on her Livejournal blog (in Russian) that she was impressed with the breadth of America’s NGO infrastructure, but remained critical of the US response to climate change. “America is a strong country and I hope it can change and become an example to the whole world of a country that treats nature cautiously and develops contemporary technologies and new energies that permit development that doesn’t harm the environment,” she wrote. She also criticized America’s confrontation position on Syria. The Institute for the Freedom of Information’s Ivan Pavlov zeroed in on the case of Chelsea Manning, formerly known as Bradley Manning, the US Army private and whistle blower who released hundreds of thousands of pages of restricted documents on US bombing operations in Iraq and Afghanistan that killed civilians to Wikileaks and other sources. Like Snowden’s revelations about the NSA, the Manning case has painted the Obama administration in a paranoid and secretive light. “I spoke about the necessity of adopting international standards of governmental openness at the level of the United Nations, on defending whistle blowers, specifically Bradley Manning,” wrote Pavlov in a Facebook posting. Manning was sentenced to 35 years in prison, but rumors of a pardon have recently been floated in various US media. Pavlov said Obama was unable to comment further as the matter is still under adjudication. Ever since Putin’s signed the law requiring NGOs that receive funding from abroad and engage in vaguely defined “political activity” to register as “foreign agents,” the impact on civil society organizations has been devastating. NGOs across the board refused to register with the Justice Ministry and self-apply the foreign agent brand when the law took affect in November 2012, protesting it was tantamount to calling themselves spies. Alexeyeva of the Moscow Helsinki Group, and many other veteran human rights activists, said the foreign agent term harkened back to the Stalinist purges of the 1930s. In response, Putin called on prosecutors throughout Russia’s regions to initiate an unprecedented sweep of NGOs in order to uncover all manner of minor violations, which were subjectively applied to financially crippling effect. The sweeps typically consisted of representatives of the tax inspectorate, occupational health agencies, the fire department and other bodies not connected to the Justice Ministry, which engaged in levying fines for supposed infractions. ERC Bellona itself was caught up in these sweeps, and though it was not forced to take on the moniker of foreign agent, it was cited for a handful of fire and health code violations which it has proved documentarily has been rectified and is protesting through legal means. Human Rights Watch reports that seven organizations have been threatened with court for not registering as foreign agents, and five have actually been dragged to the tribunal. Most prominently, the independent vote monitoring NGO Golos, lost in court and forced to pay some $13,000 in fines. The Memorial Rights Center, one of Russia’s most prominent rights organizations, has also been taken to court. Another 62 organizations, such as the Murmansk Region’s Nature and Youth environmental organization and Agora, have received warnings from prosecutors to register as foreign agents or face court and penalties. Golos has since paid the fine levied against it and essentially shut down its operations. Nature and Youth, a small apolitical activist group, received a warning over its alleged political activity: The group’s charter states its willingness to work with legislators to craft environmental law, hence indicating, in the eyes of prosecutors, politcal activity under the new NGO law. Other organizations that have been charged with violating ambiguous building codes and obscure health and fire regulations, however, can face even more crushing fines – a sort of back-door way to shut down supposed opposition groups without bringing them to trial under the NGO legislation. Pustyntsev said he was not sure that the meeting would bring about any positive changes for the daily lives of NGOs suffering under the heel of the new legislation, but said the Obama meeting raised the international profile of their plight. “The US president now has first hand knowledge of how these laws are affecting civil society in Russia, but other nations are needed to help elevate the situation to a level of international discussion,” he told Bellona. “Obama’s opinion, given the political climate against him won’t really have much of an effect, and it certainly will not affect Putin,” he said. But Pustyntsev – who said he initially had misgivings about attending the meeting – agreed that the chance that its results might find a place in international discussion about Russia was the one good thing Obama carried away from a G20 summit that seemed designed to erode his credibility. Some of the mainstays of Russia’s media did not miss the chance to take pot shots at Obama’s civil society meeting. “Either you meet with both the authorities and those who criticize them, or with none of them,” the source said, adding snidely that Obama needed to burnish his human rights credentials. “Perhaps the US president needs to show his citizens how he cares about human rights around the world,” the source said. Human Rights First, a US-based organization that has offices worldwide, praised the meeting. “Engaging civil society has been a hallmark of this administration, and President Obama demonstrated that commitment again today as he met with Russian gay rights and civil society leaders to learn more about the challenges they face,” Innokenty Grekov, of the organization’s St. Petersburg office, said in a statement. “Today’s meeting was a terrific first step. Now, as President Obama returns home from this trip, he should double down on U.S. efforts to address the concerns of civil society and LGBT activists, and continue to raise these issues in the administration’s bilateral engagement with Russia,” continued his statement. The other five activists who were present at the meeting were Igor Kochetkov, director of the LGBT Network; Yana Yakovleva, founder of Business Solidarity; Yelena Milashina, an investigative journalist with Novaya Gazeta; Ivan Pavlov, head of the Institute for the Freedom of Information; Pavel Chikov of Agora; Olga Lenkova of Coming Out; and Dmitry Makarov of the Coordinating Council of the International Youth Human Rights Movement. 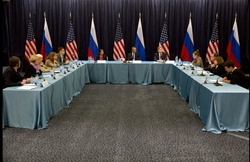 The meeting was also attended by US Ambassador in Russia Michael McFaul and Obama’s National Security Advisor, Susan Rice.